GeoBlogy, the name for the BGS blog, is a great way to get a flavour of what goes on at BGS and gives you a glimpse of the challenges and achievements of those who help to make us a world-leading geological survey. From geologists to cartographers, from groundwater to space weather and from breaking discoveries to the daily grind; you'll find all of this and everything in between on our blog and it will give you a true taste of everything that goes on at BGS. For Christmas, we thought we'd share the top 12 blogs on GeoBlogy from 2018, so sit back and relax and find out what was hot on the BGS blog over the last year. Our most popular blog from 2018 was this one from Cath Pennington, engineering geologist, landslide specialist and of course science writer at BGS. Written back in June, this blog was put together 25 years after the Holbeck Hall landslide as a result of some unseen video footage turning up in our archives, taken at the time from an aeroplane (drones hadn't been invented yet). There is no sound and the images are a little hazy due to the weather, but you can get a good idea of the scale of this landslide and some of the damage it caused. Our number two slot also goes to Cath Pennington who decided to take matters into her own hands after being told one too many times that geology is boring! In this blog Cath shares a brilliant podcast that she put together after a conference on Communicating Geoscience run by the Petroleum Group of the Geological Society. 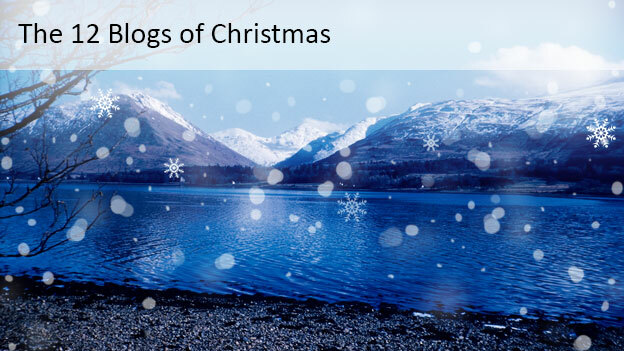 Joe Emmings, a Post-Doctoral Research Associate in shale gas and geochemistry has got the number three slot in our 12 Blogs of Christmas. His excellent blog explored how shale resources could help the UK transition to much cleaner energy such as renewables and was published as part of Green Great Britain Week, meaning that it attracted quite a lot of attention! The number four slot was obtained at the end of May when we published this blog to coincide with the release of a new dataset and web portal, that even includes a handy 'try me out' section. The new website that it talks about enabled users to input their own data and compare it with the reference data from three isotope systems (Sr, O and S) that characterises the contemporary British biosphere, in order to assess the likely geographic origins of their sample. The method has its roots in archaeological studies of human migration for example to establish a likely place of origins of our ancestors but it is likely to be applicable to other research areas such as forensic and food traceability. The number five place goes to Gerry Wildman, data and science services manager at BGS. Gerry's blog tells us of the impact of BGS scanning our collection of legacy borehole records and releasing them as open data on our OpenGeoscience website. Overnight, the number of borehole records accessed went from 2,000 a month to 20,000, and in 2017 we logged over 2.5 million downloads! Back at the start of 2018, Fiona Sach, currently the elephant coordinator for the Zoological Society of London wrote a guest blog for us updating on her work into reducing Human-Elephant Conflict surrounding Kruger National Park. The interdisciplinary project involved geochemistry, plant science and animal health between a range of partners including the BGS and the University of Norttingham. Some of our most popular blogs are about the various career development opportunities at BGS, and Rachael Ellen's blog from July is an example of this. Written back in July, Rachel's blog tells us how she took a break from the world of geology to do something completely different and outside of her professional comfort zone and took an adventure into the world of software development supported by the BGS Sabbatical Scheme. Back in 2017, one of the largest storms of the current solar cycle hit the Earth. Starting around 11.30pm on 7th September, the first and deepest part of the storm lasted for around 3 hours and beautiful aurorae were visible all across the UK. At around 1pm on 8th September a second burst arrived though it was during the day in the UK so the aurorae were not visible. They were however detected by the newly installed BGS Schools Magnetometer Network! Ciaran Beggan, geophysicist at BGS and member of the geomagnetism team tells us all about it in the number eight blog in our list. Published in recognition of the UN International Day for Disaster Risk Reduction in October, Joel Gill's blog celebrated the actions that people and communities around the world are taking to reduce their exposure and vulnerability to disasters. It also reflected on the research, innovation and training needed to advance this work and ensure sustainable and resilient communities and looked at how BGS is working to address many of these issues. Back in September, Melanie Leng, Science Director for the Stable Isotope Facility & Director of the Centre for Environmental Geochemistry, wrote a series of article for Geoscientist, the magazine of the Geological Society, giving advice for new and current geoscience PhD students. She very kindly put this into a great blog with seven key points that range from organising your data to dealing with your supervisor. Our last two blogs are both written by BGS Director of Science and Technology, Prof Mike Stephenson. The first one looks at how important geoscience is to energy transitions and he looks at the technologies and geopolitics that underlie present and historical movements in energy sources including the most recent move towards renewables from fossil fuels. 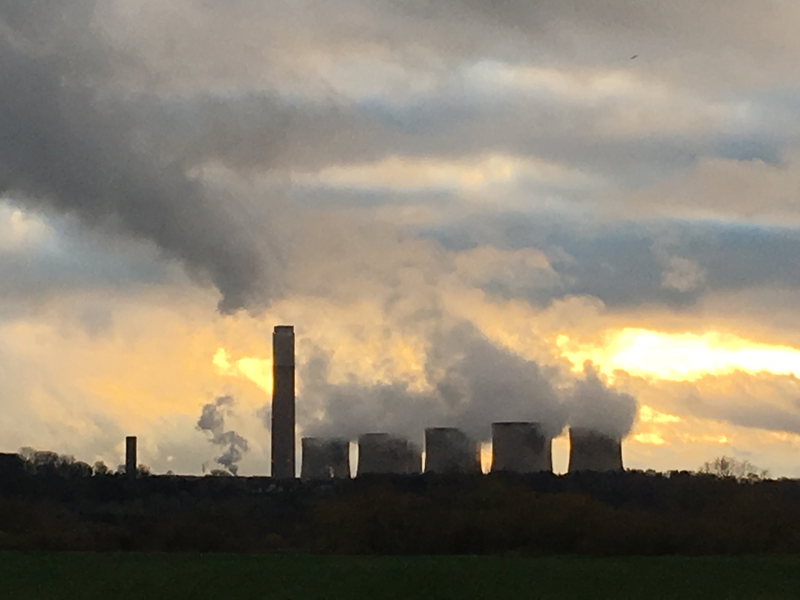 The last of our top 12 blogs is again from Mike Stephenson and looks at the 'geology-energy-climate nexus', or the intimate relationship between geoscience, energy supply and climate change. This very much concerns groundwater and its importance to climate change adaptation with the question of just how important groundwater will be in helping people to adapt to climate change. You can receive regular updates from GeoBlogy by subscribing using your email address here. Over the years, I’ve sat in many conversations about how we continue to meet rising demand for energy, while tackling climate change and managing the impact on the environment. I’ve heard from bosses getting energy into the heart of people’s homes, people facing the prospect of energy being extracted from beneath them, analysts working out how we get renewables to power the future, and many others. The role of a professional communicator is not to participate in these conversations but to facilitate them. Our most important skill is listening, to what people want and need to know; who they want to talk to; what they have to say; and how they say it. Only by listening can we bring the right people together to improve the discussions to find better solutions. As we spend most of our time absorbing what other people have to say, our insight is shaped by many perspectives. We learn a lot and we develop a comprehensive overview. Every now and then, we are asked to share it. Last month was one such occasion. I was invited to speak at the UK launch of the International Energy Agency’s (IEA) 2018 World Energy Outlook about what it meant for engaging with people outside the energy industry. The IEA crunches the world’s energy data and each year explains what’s driving demand, how we’re meeting it, what markets are emerging and how we’re performing against carbon emission targets. On the face of it the World Energy Outlook is bleak. Upward population growth. Upward demand across the world. Upward CO2 emissions. Slow renewables growth. On that drizzly November morning in London as the UK’s population of 69 million buzzed through their daily routines, just 80 people heard the CEO of The Committee on Climate Change Chris Stark call for ‘everything to happen everywhere across everything’. Against this outlook, as an advisory board member of the CIPR's Energy Leadership Platform and the British Geological Survey's strategic communications manager for energy decarbonisation, I was asked to share my insight into how we develop sensible, clear and concise fact-based narratives about where we are and where we are going. As I looked out across the crowd of the usual suspects in that safe London lecture theatre, I took a deep breath and told them they were asking the wrong question. Fact-based narratives are not lacking. Nor is the ability to explain them in a concise, clear and sensible way. What’s missing is the appetite to bring together people unlike one other into a single conversation. That morning, I championed the value of every community member, business, scientist and public official taking part in the energy conversation. Those against all activity in the underground environment. Those against the pursuit of fossil fuels. Those who look to the sun for the answer. Those who look to technology. Those who know we can’t do without oil and gas. Those who know we need the underground to scale up renewables. Those who know that everything we depend upon either comes out of the ground or grows in it. Each narrative is clear and concise. Each perspective borne from knowledge and experience. Every position a valid part of the discussion and solution. If everything must happen everywhere across everything to solve climate change, then everyone must take part in the conversation to get the solutions working. Our single biggest learning from engaging with people on our UK Geoenergy Observatories proposal (research facilities that will answer vital questions about how the subsurface can help to deliver a cleaner, future energy mix) is that so few forums exist in which the conversation about our resources reflects the complexity of the problem. Where they exist, none are inclusive. It was late in our engagement programme that this penny dropped. We were one of the few, perhaps only, organisations providing an open forum in which anyone who wanted to contribute to the energy and climate change debate could do so. Understandably people were frustrated. They had an important contribution and no way to make it heard. Conversation was, therefore, drowning in a good versus evil rhetoric. Discussion was short-circuiting in adversarial dialogue. Then we showed up, in standard-issue BGS blue t-shirts with tea, biscuits and graphics. We showed up again. And again. And again. We met a diverse crowd. With diverse views. We saw the challenge from every angle. The economic bodies vested with sustainable growth. The innovators solving tomorrow’s problems. The educators making the next generation work-ready. The industry drivers keeping the wheels turning. The community representatives taking care of life today. The conversation people wanted to have moved way beyond the science of managing the subsurface through to politics, economics, ethics, morals and values. We stayed on the right side of the line. 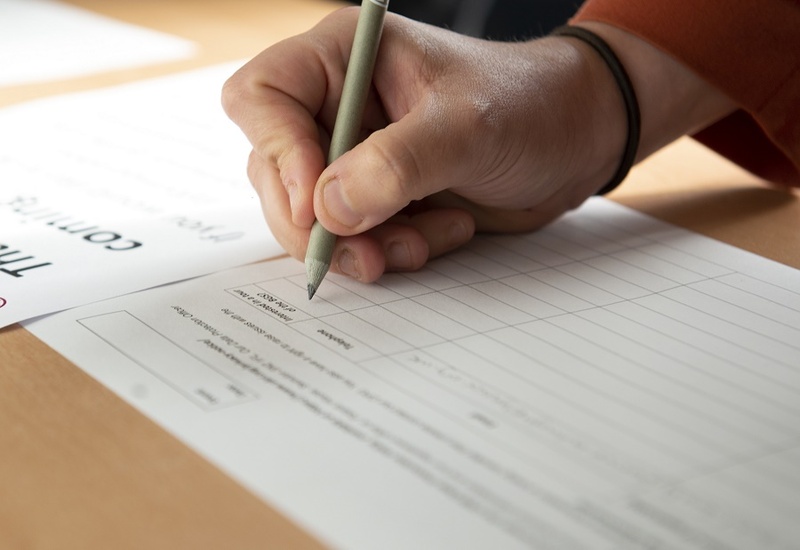 We are experts in geoscience and have a statutory duty to provide independent evidence to everyone – whether you’re in government, industry, academia or the public. So, we explained the boundaries of our expertise, facilitated debate, provided input on the science wherever appropriate, and signposted people to researchers, regulators, decision-makers, policy-makers or industry where questions were not ours to answer. So very many geoscientists are excited by the UK Geoenergy Observatories as an opportunity for people to learn about the underground environment: Understanding that it feeds us, clothes us, cures us and keeps us warm, safe and dry. It’s hard to dismiss the rationale that because we demand so much of the underground, we must take much better care of it. They hold great optimism that here is a chance to demystify the underground, shifting perception from the stuff of ancient myths and legends to images created by great data, scale and state-of-the-art modelling. Their enthusiasm for the potential knowledge gained is infectious: from how reservoirs affect the rocks to how quickly aquifers replenish. However, as is so often the case when you open a conversation to impart what you know, what you discover is so much more valuable. Through the scores of opportunities we've created for people to find out about the importance of geoscience in meeting our future energy needs, tackling energy poverty, addressing climate change and improving environmental management, we’ve begun to understand how to change the energy conversation. It sets a challenge for us all – for every public body, academic institution, industry player and community member. We will only find workable solutions when we include everyone who wants to be part of the conversation. It enables us to begin to understand one other. To develop trust. To generate genuine and honest two-way dialogue. This means that, however incongruous and difficult it seems, the suits, scientists, number-crunchers, and policy-makers must sit alongside the nannies, farmers, engineers, teachers, landowners, industry executives and campaigners who want to be heard. Not just once but as the norm. Trust is only gained by putting yourself forward time and again. It’s not easy. It’s not quick. It’s not cheap. But urgent action from ‘everyone, everywhere, across everything’ to tackle climate change requires new solutions. To turn our energy options from black and white to shades of green, we must put long-term gain ahead of short-term cost. As our friends at the IEA reminded us last month, the solution to climate change must start in the developed world. Perhaps, the very resource, skill and ingenuity that turned Britain into the birthplace of the industrial revolution is the same alchemy that can put the UK at the forefront of the environmental revolution. Global action on climate change starts at home with a better fireside chat about how we keep the embers glowing and the trees growing. Cristina Chapman is the UK Geoenergy Observatories communications manager at the BGS and Advisory Board Member for the Chartered Institute of Public Relations Energy Leadership Platform. I have almost completed my 1-year industrial placement in the Inorganic Geochemistry team at BGS, and will soon be back in New Zealand to finish my undergraduate degree at Waikato University. My experience has included fieldwork in Kenya, aqueous chemistry analyses for BGS science projects and external clients. The experiences I have gained from this placement branch much further than broadening of my analytical and research abilities. My leadership skills, independence and confidence within my own abilities has grown immensely due to the responsibilities I have been tasked with. My research project aligned with Andy Marriott’s Newton International Links project – Aquaculture: Pathway to food security in Kenya, which is investigating the contribution of micronutrients from wild and caged Nile tilapia in Lake Victoria to dietary intakes in the Winam Gulf basin. In addition, possible inorganic contaminants were measured to define potential pollution pathways, hence food safety. This work also supported CEG activities with the University of Nottingham, who measured antimicrobial resistance as a result of exposure to metal pollution. In my previous geoblogy I talk about the exciting adventure I was a part of in May as we undertook fieldwork on Kenyan Marine Fisheries Research Institution (KMFRI) research vessel R. V. Uvumbuzi, sampling Lake Victoria for waters, sediments and fish. Life aboard the R. V. Uvumbuzi. I tried my hand at all aspects of fieldwork, from sampling to navigation. The filtered waters, fish tissue and sediments were analysed back at BGS for general chemical parameters, mercury and a full suite of elements on the ICP-MS. It was clear to see while sampling that the water quality in Winam Gulf was much poorer than the greater Lake Victoria basin, as it ranged from vivid green in hypereutrophic and high-density aquaculture zones near cities, to murky brown throughout the Gulf. Waters within Winam Gulf had much higher concentrations of anions, cations, alkalinity, TDS and many other parameters than the greater Lake Victoria basin. This, coupled with a low TN:TP ratio in shallow Winam Gulf waters, indicates that Winam gulf is hypoxic and of poor quality for aquatic life to grow. The water quality of Winam Gulf was poor compared to the main Lake Victoria basin. A typical daily portion of fish comprises of 100g of tilapia and compared to an average Kenyan PMTI (provisional maximum tolerable intake), none of the potentially harmful elements studied for wild or caged tilapia were greater than 4% of the PMTI. Hence, the health risks associated with consuming tilapia were low. However, 100g of both caged and wild tilapia exceeded 10% of the RDI (recommended daily intake) for numerous essential micronutrients, and was noticeably higher for selenium. This indicates that the tilapia sourced from both caged and wild sources is a good source of nutrients. Part of my research outcome and possibly the next step would be to do more research on the nutritional quality of caged tilapia to improve Kenya’s food security. Back in the UK I have soaked up as much of the British culture as I could, experiencing snow for the first time, the special magic of a winter Christmas (although I am looking forward to spending it at the beach this year! ), and the attraction to a beer garden on one of the precious summer days. During my personal time I have travelled around Italy, Spain, the Netherlands, Germany, Croatia, Scotland and Wales, and have been amazed by the rich culture and history that we Kiwi’s aren’t accustomed to. Thank you to all of the wonderful people I have met during this journey, the mentors who have guided me towards finding a new passion in aquaculture research, and to the lifelong friends who have made this year the best of my life! This year has taught me that success is the result of a combination of opportunity and hard work. If you are lucky enough to find yourself in the right place at the right time, apply yourself and you will be amazed at the results. This is my role and although it might sound easy, it really isn’t!! My name is Virginia Hannah. I have worked at the BGS for over 15 years starting out as a Secretary, later known as Business Assistant. More recently, I have become a Project Coordinator, working on various science projects within the Informatics Directorate. I now coordinate and bring together the practical and necessary elements of the projects, which a scientist may not always think about, enabling the effective delivery of their science. to make web-accessible the best available geological and other geoscience data worldwide at the best possible scales, starting with at least 1:1 million scale. There is also one face-to-face meeting annually, which the Board Members take in turns to host in their own country, but again, it is my role to coordinate. I spend lots of time liaising with science and administration staff, where there is quite often a language barrier to overcome, to manage the usual logistical requirements for the meetings. In addition to the day programmes, I also organise evening events such as conference dinners; ensuring time for networking, I have to bear jet lag in mind and make sure delegates are not is falling to sleep in their soup! I also manage the material we need to take with us, such as pop-ups, give-aways, posters etc, and determine how we are going to get that stuff to the venue. Whether that be filling peoples cases up for them or arranging courier deliveries, which can be a nightmare if you only have a conference venue address to deliver to! I manage the administration of the project and all of the communications and outreach activities. I am responsible for purchasing all marketing material as well as creating flyers, posters and creating and editing newsletters. I attend the meetings to report on marketing progress and expenditure, as well as take notes and detailed actions from the meetings, which I monitor for progress and closure after the meetings. This year the Geological survey of Canada (GSC) kindly hosted us at their offices in Vancouver, 13-15 June. OneGeology celebrated its 10-year anniversary in 2017-18, so to celebrate the board decided to make this event in Vancouver bigger and hold a three-day meeting. So adjacent to the usual one day face-to-face board meeting, we hosted the annual Technical Implementation Group (TIG) meeting and ran a one-day regional workshop, which outlined the focus of the project for the next ten years, with a particular focus on North American involvement. To manage these events, I worked closely with the team at GSC, Boyan Brodaric and Sonya Ryou. The invited delegates came from all over the world: UK, Japan and Australia to name a few. Many people that attended gave presentations, which you can find on the OneGeology website along with the minutes from each event. Prior to the meeting, I had to plan the timings of these presentations and work with the IT team to ensure that the rooms that we had been allocated, were equipped with the correct equipment to make the presentations. During the meeting, I also had to make sure that the presentations were loaded onto the meeting PC and ready to run at the correct time in the agenda. I worked alongside the chair to make sure that the presentations ran to time. To communicate the considerable achievements of the last ten years, we aligned the OneGeology meetings with the Resources for Future Generations conference, which was being held at the Vancouver Convention Centre. Session 4 was The changing roles of geological surveys. Here, Carina Kemp (GeoScience Australia), Matt Harrison (BGS) and François Robida (BRGM) presented and ran the discussion session about the OneGeology project. They described how big data is managed within the international geological survey community and explored how exciting new technological directions, such as the application of artificial intelligence, will impact next generation geoscience and the geological survey organisation of the future. I helped to co-ordinate participation in the session prior to the conference and attended to ensure they ran smoothly. I also minuted the session and took photographs, which I tweeted from @onegeology and will feature in the next OneGeology Newsletter. At the conference exhibition, we also had a booth in association with the rest of BGS. The booth was staffed by BGS personnel attending the conference. I wanted OneGeology to be represented at the booth, so prepared a timetable for an expert to be available during certain times every day to answer any questions and give advice. I took a corner of the booth and set it up with OneGeology information and products to entice delegates to take an interest. 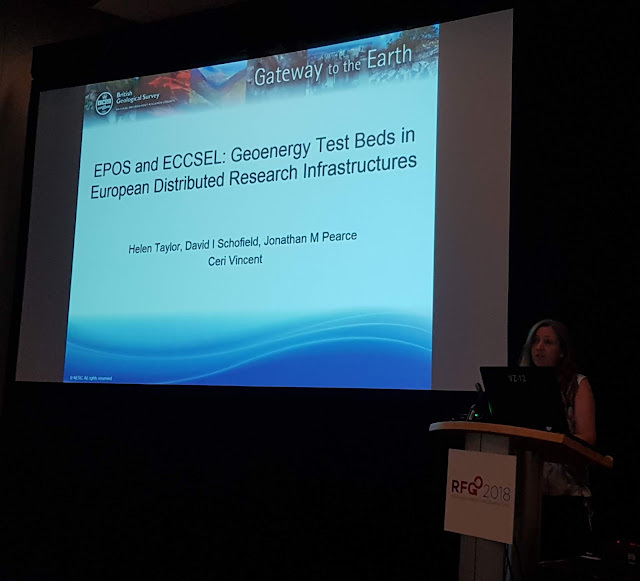 Mohammadreza Jalali from ETH Zurich, who presented; In-situ Stimulation and Circulation Experiment as a Decameter Geo-Energy Test Bed for Enhanced Geothermal System Development presentation, on behalf of EPOS GETB during the same session. I attended both presentations to take notes and pictures to communicate to the wider EPOS community through our dedicated GETB web page and to produce an article for the external newsletter, produced by the EPOS programme management office. This was the first time I had the chance of attending a conference of this size and it was exciting to have the experience. It was challenging because I hadn’t experienced a science conference as a delegate before and being a ‘non-scientist’ I found it difficult to know which sessions to attend. When I did find talks that I wanted to see, they were all over the place, and this convention centre was BIG, so navigation was fun, but I managed it and attended some great sessions. Attending the conference meant I finally met people face-to-face who I have worked with remotely for years. I would not necessarily have met them in person otherwise. It has given me a greater understanding of the need to network and insight into some of the collaborations BGS has going on globally, and the complexity of how these intertwine with other collaborations closer to home. It has also strengthened my confidence in the work that I do within these collaborative projects and how my role fits into the bigger picture. As well as this, I got to hang out with a moose and was fortunate enough to see this beautiful view of the Rockies out of the aeroplane window on the way home…if Carling made sunsets! In October, a few of us spent a week in the beautiful Scottish Highlands looking at landslides and we've made a video about it. The trip was just after with a period of very heavy rain that triggered some debris flows that closed the A83 Rest And Be Thankful Pass where these types of landslide are a regular occurrence. Staff attending the training week had a range of different expertise and were mostly from the Landslides Team in Keyworth and Quaternary Geologists from our Edinburgh office. These are two groups of people trained to look at the landscape in different ways. The idea was for the Landslides Team to get a better understanding of the Scottish geology - a complex beast that can produce different landslides to those elsewhere in the UK - and for the Quaternary Geologists to further their expertise in landslides, especially debris flows. the rapid down-slope flow of poorly-sorted debris mixed with water. Debris flows are a particular problem in Scotland. Their biggest impact is to cut across roads and railways that can leave communities isolated and important routes blocked. Perhaps the most famous repeated site of debris flows is the Rest And Be Thankful Pass where the closure of the road results in a 55-mile detour. How we put debris flows on our maps is something we are working on at the moment and this produced a lot of discussion in the field. We also used the examples we visited to help us consider our GeoSure Debris Flow Model, a map that provides information on the potential of the ground to form a debris flow. Debating the geology, the geomorphology, the palaeoenvironmental history and ... just a lot of debating! of the valley which is a great vantage point to see how the slope is behaving. The training course was well received by everyone attending and has opened the door to plenty of collaborative work that can only be beneficial to everyone. We even came across this: Landslide beer! It was named after the debris flow that blocked the road near the brewery, but also because of the repeated debris flows on the A83 that leave the brewery cut off. The initial debris flow is documented in our National Landslide Database (17693/1) as well as many of the others on the Rest and Be Thankful Pass. On a recent visit to the spectacular Iron Bridge in Telford Shropshire I was reminded not only of the engineering genius that designed it - Thomas Pritchard - but also the factors that came together to make the bridge possible – a gift of good geography and geology. The bridge, opened in 1781, is widely seen as a symbol of the birth of the industrial revolution in the fact that its construction involved the use of raw materials on an industrial scale – limestone, coal and iron ore. Without these three resources in close proximity to the town of Ironbridge and the bridge itself, this famous construction would simply not be there. The industrial revolution set the world on a course of the large scale of use of resources including fossil fuels and therefore on the course of a period of emissions that could be called ‘carbonisation’. We now need to decarbonise, but for some of the most challenging parts of decarbonisation, for example industry, transport and domestic heating, good geography and good geology will still matter. We are witnessing rapid progress in the decarbonisation of electricity production with wind and solar costs dropping rapidly. But electricity is the easy area to decarbonise. Industries that make steel, aluminium, cement and ammonia won’t be so easy to decarbonise because the processes they use produce CO2 emissions directly, and because they use very large amounts of fossil fuels and electric power. Domestic heating is also hard to decarbonise. The UK, for example, uses more energy in heating than for generating electricity and for running its transport system. Around 70% of this energy comes from burning gas producing more than a quarter of the UK’s CO2 emissions. The decarbonisation of industry, transport and domestic heating sectors needs planning and thought. One solution is to develop geographical clusters that can exploit existing industrial infrastructure together with natural geological resources and other advantages to allow local solutions. An example is the hydrogen economy – the idea that hydrogen can provide a fuel for cells to drive vehicles, heat houses and power industry . Its production may in the longer term be through electrolysis of water using excess (renewable) electricity, but in the short term is more likely to be produced by steam methane reforming (SMR) from natural gas which produces CO2 and hydrogen. The latter is a useful zero carbon fuel, and the former can be used or most likely will need to be disposed of geologically. The key point here is that geological disposal of CO2 can’t be done everywhere, because only specific geologies are suitable. It’s also known that to make the hydrogen economy work, huge amounts of the gas will be needed, and therefore so will large local storage. In most cases, this means geological storage in salt. So geography and geology are again important. An example is the H21 Leeds City Gate project which seeks to convert the existing natural gas network in Leeds – used mainly for heat - to 100% hydrogen. A batch of four SMRs on Teeside will produce the hydrogen needed while the waste CO2 will be captured and disposed of offshore in the southern North Sea. Capture is well established and the technology for disposal has been demonstrated at scale for over twenty years close to the Sleipner Gas Field in deep North Sea rocks. Salt cavern storage in the Tees and York areas will be needed for ‘intra-day’ and ‘intra-seasonal’ swings in demand as heating is turned on and off by consumers. 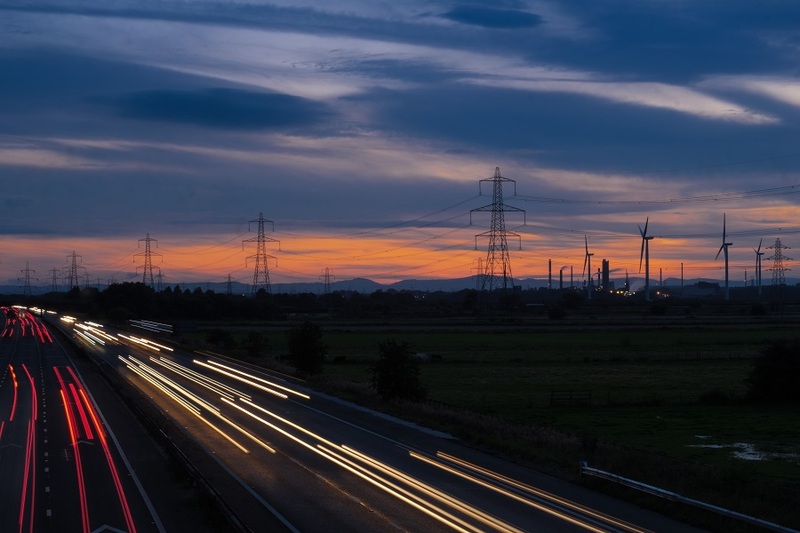 Beyond heating, the availability of low-cost bulk hydrogen in a gas network could revolutionise the potential for hydrogen vehicles in the North East and, via fuel cells, support a decentralised model of combined heat and power and localised power generation. A similar project, the Liverpool-Manchester Hydrogen Cluster, aims not just at decarbonising domestic heat, but also at decarbonising major industrial gas users in the Liverpool-Manchester area, including in the oil refining, glass manufacturing, food and drink, chemicals and pulp and paper sectors. The main use of gas in these industries is for heat production, whether in furnaces, ovens or combined heat and power (CHP) plants. The Liverpool-Manchester area also has good geology. The nearby Liverpool Bay ‘complex’ of hydrocarbon fields located in the East Irish Sea off the coast of Merseyside, could be repurposed to provide CO2 storage and these fields are likely to cease production around the time that a cluster concept might be reaching maturity. In the early stages the Liverpool-Manchester Hydrogen Cluster does not envisage H storage in salt because many local process industries operate continuously, so little change in demand is forecast daily or annually so there aren’t big fluctuations in demand. However the area is rich in salt deposits which will be well suited for a larger roll out of hydrogen. The area also benefits from two established pipelines that already transport hydrogen, as well as pre-existing skills and capability related to the production, handling and use of hydrogen. Perhaps most important is the fact that local ‘energy ecologies’ – collections of energy users and producers - are beginning to work together to realise the need to decarbonise. This added to the local funding arrangements of the Government’s new Industrial Strategy as part of the ‘place agenda’, will provide the impetus to make decarbonisation happen through carefully targeted government funding along with co-funding from industry to address market failure. The cluster concept underlines the need for industry and government to work together to decarbonise, but also the importance of the distribution of useful rocks, and ultimately the importance of geology in decarbonisation. This is alongside the decarbonisation options that rocks also provide, including geothermal power and cooling and air conditioning, as well as the potential for large scale heat and energy storage. Back in the Eighteenth Century the impetus to build the Iron Bridge came from local entrepreneurs, including Abraham Darby who first smelted local iron ore with coke made from Coalbrookdale coal in 1709. Darby had agreed to construct the bridge with a budget of £3250 and this was raised by sponsors of the project, mostly early industrialists from surrounding towns and villages. The bridge probably cost about twice that - around £700,000 in today’s money. This was an investment that was part of the ‘carbonisation’ process which was the industrial revolution. The same kind of partnerships are being formed in the new decarbonisation clusters again driven by the opportunities that new technologies can bring to local economies. If you are interested in the wider geology – energy – climate nexus read my new book: https://www.elsevier.com/books/energy-and-climate-change/stephenson/978-0-12-812021-7. Also register for this exciting conference (https://www.geolsoc.org.uk/Lovell19) on the role of geology and decarbonisation. the trees further up the valley sides. Swirls of steam and the deep ‘bloop, bloop’ sound of bubbling mud pools greeted me on my first visit to a geothermal prospect in Costa Rica during my PhD fieldwork in the mid 1980s. Heat energy was literally pouring out of the ground, and the visit opened my eyes to the potential of geothermal energy as a renewable energy resource. Now, some 30 years later, geothermal power produces some 15% of Costa Rica’s electricity, with 80% coming from the prospect I studied. This, together with power from other geothermal areas and a very large hydroelectric capacity, allows >99% of Costa Rica’s electricity generation to be from renewable sources, and the country aims for its power supply to be carbon neutral by 2021. And Costa Rica is not the only country with high aims. I write the first part of this blog on the return leg of a long-haul flight from Mexico where I have attended a meeting of the GEMex project - a €20M EU-Mexico collaboration which aims to enhance understanding of two geothermal systems east of Mexico City. Over 100 scientists from across Europe and Mexico spent 4 days visiting working geothermal operations, discussing their latest data, and trying to combine many different strands of research into coherent models for the two study sites. Our busy schedule started with a four-hour ride in the back of a minibus to the Los Azufres geothermal field. 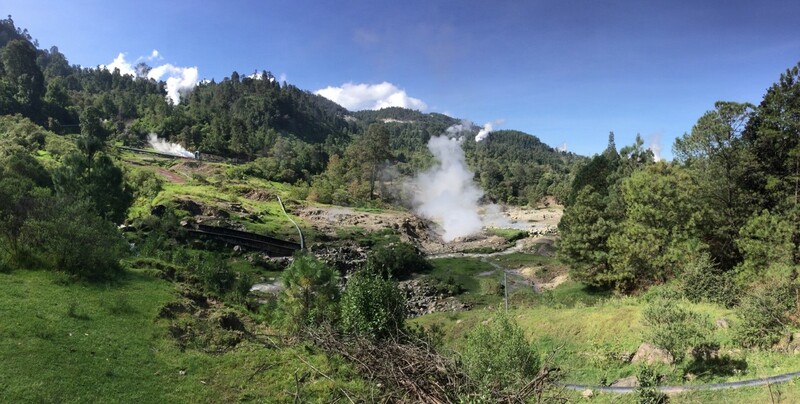 This geothermal field has an installed capacity of about 200 MW, and produces some 20% of Mexico’s geothermal power. The geothermal field covers many square kms, and is in a beautiful area of rolling countryside. We walked through pine tree-lined valleys to study natural features of hydrothermal areas, including fumaroles, bubbling pools and hydrothermally-altered rocks. We were also allowed to visit the surface infrastructure of a geothermal plant, including: production wells, injection wells, turbine halls and the control centre of the whole operation. Unfortunately, time did not allow us to visit the numerous geothermal spas in the area. cold people being barely visible left of centre). The steel of the wellhead had a temperature of approximately 150°C. And lab experimental and mineralogical studies to fluid-rock reaction processes that may impact fluid flow with the deep, currently exploited geothermal reservoir. Developing Los Humeros and Acoculco, and other systems, will help Mexico achieve its own target of 50% of its energy from ‘clean energy sources’ by 2050. The knowledge learned will also help in Europe’s geothermal development, which could provide an important contribution towards the European target of at least 20% of its total energy needs being via renewable sources by 2020, and 32% by 2030. Whilst achieving 100% renewable energy generation is akin to the Holy Grail of national energy targets, any significant move in that direction would mark a huge shift away from our dependence on CO2-producing fossil fuels which have been the mainstay of our energy-generating technologies since the Industrial Revolution. However, we must make this transition, as climate change driven by release of greenhouse gasses to the atmosphere is one of the biggest challenges we currently face. And the UK is also rising to the challenge of renewable energy generation. On returning to the UK I travelled to Cornwall where a large drilling rig is being erected at United Downs. Once assembled, it will spend some 7 months drilling two deep boreholes into the Carnmenellis Granite, one of which could be up to 4.5km deep (thereby becoming the deepest onshore borehole in the UK). 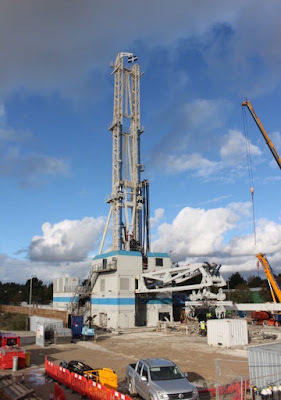 This £18M United Downs Deep Geothermal Power Project aims to tap deep natural fractures filled with groundwater at 180-190°C and prove the feasibility of a fully working ‘engineered geothermal system’ (EGS) that can export electrical power to the national grid. This exciting project will utilise modern technologies to convert heat energy to electricity, and builds on expertise gained in the previous ‘Hot Dry Rock’ geothermal project which ran in Cornwall in the 1980s-1990s. 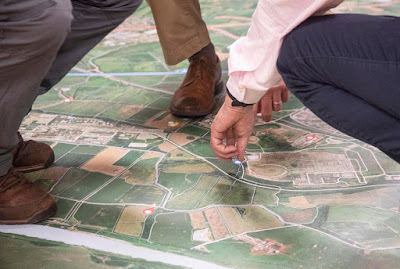 If the United Downs Deep Geothermal Power Project succeeds, then it will open up the possibility of parts of the UK’s deep geosphere becoming a renewable energy resource for the future. Since starting work on this blog, I found out that I have just won £1.8M from NERC for a Highlight Topic focussed on understanding the deep geothermal resources of Cornwall (project = GWatt). This study (which also involves Herriot Watt University, Camborne School of Mines, GeoScience, Geothermal Engineering Ltd, and the Cornwall and Isles Of Scilly Local Enterprise Partnership) aims to reduce the uncertainty associated with geothermal exploration through a detailed appraisal of existing and newly gathered data. Key to this will be the incorporation of new data coming from the United Downs Deep Geothermal Power project. The European Union Horizon 2020 research programme for funding for the European half of GEMex under grant agreement 727550. Thanks go to the Comisión Federal de Electricidad (CFE) for allowing the site visit and access to their facilities, and providing many explanations of the different parts of their powerplant.